A while ago I read an article that suggested I’d “look up and scan my field of vision for a nature check”. “How many potted plants are around you?” I counted a suffering IKEA palm in the corner and a lonely, petrified cactus on my desk. “Can you see a patch of grass or a tree through a window?” No, I could not. Although we as humans have a tendency towards the natural world, as suggested in the biophilia hypothesis, we now spend the majority of our time in enclosed and relatively sterile spaces. Despite studies showing a natural environment can lift our spirits and allows us to focus better we city dwellers find ourselves more and more detached from nature. The biophilic design trend in architecture and interior design is trying to bring back occupant connectivity to the natural environment through the use of direct nature, indirect nature, and space and place conditions. On the website of the International WELL Building Institute (IWBI), an organisation that developed a framework for biophilic design, you can find practical advice on how to implement these principles yourself. Besides allowing in natural light and choosing a natural layout for the interior (these things are harder to influence when you rent, like we do at Edmire) the IWBI sets standards for integrating environmental elements into your interior. Their norm states that plant beds and pots should cover 1% of the floor area and plant walls must cover 2% of the floor area. Last month Jonas from De Bloemerie helped us find new green additions to our interior, and with his help we have more than quadrupled the green surface in our office to about 5m2; or double the IWBI standard! It does not sound like much but a few square meters of green quickly amounts to a lot of leaves. A quick win if you have plans yourself: start with a Monstera. They are affordable, grow very fast and are easy to attend. Besides putting you in a better mood plants can also help purify the air in your workspace or home. In addition to absorbing carbon dioxide and releasing oxygen through photosynthesis, plants may also provide a natural way of removing toxic agents such as benzene, formaldehyde, and trichloroethylene from the air. That is why one of our new green arrivals now inhabits the prototyping lab. This Devil’s Vine helps us filter the air when we have used the glue gun on a prototype or when the 3D printer has been working overnight. 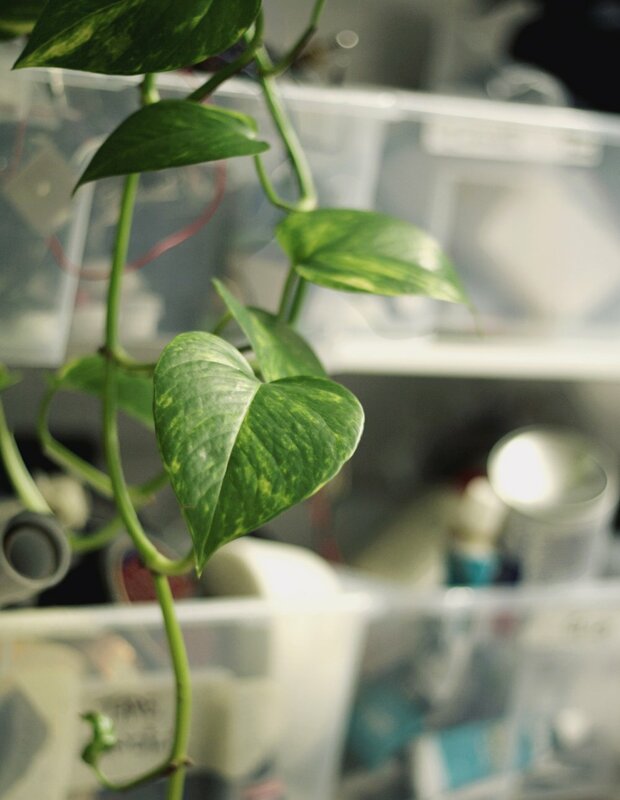 Curious about the capabilities of your houseplant? You can look up their specific skill set in a list provided by the NASA Clean Air Study. Want to find out more about biophilic design and the positive impact of green surroundings?